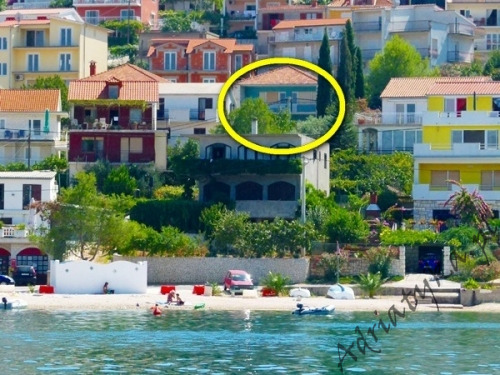 Nice, big house (located just 60 m in a straight line from the sea) in which can be accommodated up to 12 people (10 adults + 2 children up to 7 years old), category ***, ground floor / first floor, air conditioning x 2 (on both floors), TV, internet, radio, five bedrooms (including three with exits to the terrace / balcony), two kitchens, two living rooms (each with exits to the terrace / balcony), two large bathrooms, washing machine, iron, ironing board, clothes dryer, garden, large private parking, two grills, two large terraces, balcony, view of the sea and green area, table and chairs on the terrace and balcony, smoking is allowed in the house. Both kitchens equipment: kitchen utensils and tableware according to the number of persons, two refrigerators, two gas-electric kitchens, two large freezers, electric kettle, two ovens. Bathrooms equipment: complete, bath with shower. Number of rooms: 5 + 2 living rooms, the total number of beds in rooms: 7, number of double beds: 5 (including one sofa bed), number of single beds: 2. Baby cot available on request (included in the rental price). 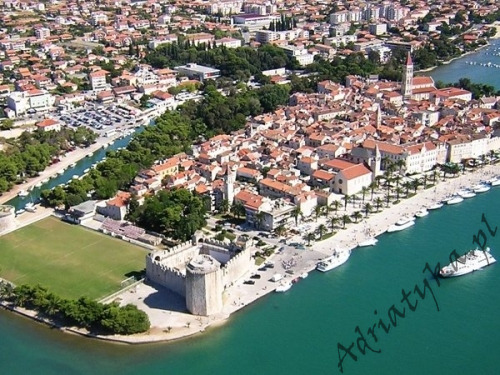 Distance to the bus stop is 120 m, distance to the train station is 10 km (Kastela), distance to the nearest airport is 5 km Split (Trogir), distance to the nearest ferry port is 35 km (Split), distance to the main road is 3 km, distance to the nearest exchange bureau is 3 km, distance to the cash point is 3 km, distance to the restaurant is 500 m, distance to the grocery store is 120 m, distance to the petrol station is 5 km. Very nice pebble / rocky beach, distance to the beach is 150 m, distance to the sea is 150 m (in a straight line distance from the sea is about 60 m). Large, nice, two-storied (two apartments) house. Guests have at their disposal internet, private parking, two large terraces, large balcony (with sea view), table and chairs on the terrace and balcony, two grills, garden. Check-in after 14:00 h. Check-out till 10:00 h.